Maintains a continuous lookout ahead, except when making brief checks of the mirrors and other directions. When driving straight, checks mirrors often enough to maintain awareness of surrounding traffic. The required frequency varies with conditions. Checks the internal mirror immediately before braking. When turning, looks in the planned direction of travel before making the turn. 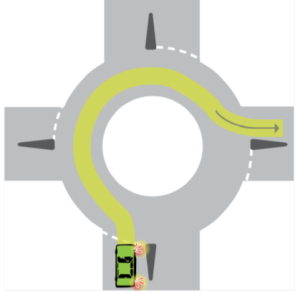 When making a 3-point turn, looks in both directions along the road immediately before moving across the road (before and after reversing) and immediately before reversing out of a driveway or away from the kerb. 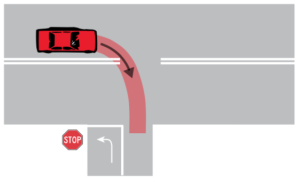 While reversing as part of a 3-point turn, looks in the direction of travel. If no other road user has to take evasive action, a Critical Error (Fail to Look) is recorded. If Observation is also being assessed for that task, record a No. If a road user has to take evasive action, record an Immediate Termination Error (Fail to Give Way). 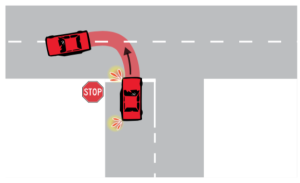 A head check is required when diverging to ensure there are no undetected vehicles in blind spots. 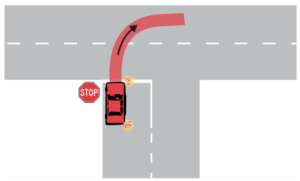 When pulling out from a parked/stationary position, activates the appropriate indicator for at least 5 seconds before moving even if no other traffic is present. activates the left-turn indicator before leaving the roundabout if practical (note this not usually practical at any but the largest roundabouts; for each roundabout on a test route, the VicRoads Customer Service Manager will determine whether a signal is required when leaving). When turning left or right, does not activate the indicator so early as possibly to mislead other road users about which street the applicant intends to turn into. Maintains the turn signal until the turn or diverge has been completed. Note that if the signal is incorrectly executed (e.g. not activated soon enough or cancelled too soon), No is recorded for Signalling but a Critical Error (Fail to Signal) is not recorded. Fail to Signal applies only if a required signal is omitted altogether. If no other road user has to take evasive action, record a Critical Error (Fail to Signal). If Signalling is also being assessed for that task, record a No. No should be recorded for Signalling if the applicant does not signal before leaving a roundabout where it was practical to. A Critical Error (Fail to Signal) should not be recorded. 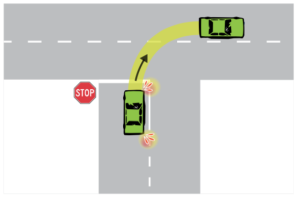 Observed behaviour: The applicant activates the turn signal only 1 second before making a right turn. Assessment: A signal is required at least 3 seconds before turning. No should be recorded for Signalling. Figure 2: A signal is required when changing lanes. (Note: ‘P’ indicates a parked vehicle.) Figure 3: A signal is required when diverging, even if no other vehicles are present. 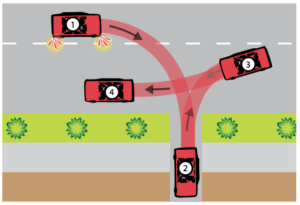 Figure 4: A left-turn signal is required when entering a roundabout intending to leave at the first exit, if the first exit is less than halfway around the roundabout. 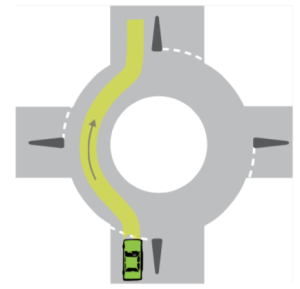 Figure 5: No turn signal is required when entering a roundabout intending to leave at an exit that is halfway around the roundabout. Figure 6: A right-turn signal is required when entering a roundabout intending to leave at an exit that is more than halfway around the roundabout. Selects the first available safe gap after an initial period of observing approaching traffic to identify a gap. If the applicant’s gap selection is so unsafe it requires another road user to take evasive action, record an Immediate Termination Error (Fail to Give Way). Drivers who reject safe gaps increase congestion and delays, frustrating road users. Observed behaviour: The applicant is waiting at a Give Way sign to turn left from a local street onto an arterial road. She waits for several vehicles to pass, then continues to wait during a safe gap. She eventually completes the turn safely during a later gap. Assessment: The applicant has selected a safe gap, but not the first available safe gap. No should be recorded for Gap Selection. Observed behaviour: The applicant is approaching a Stop sign in a local street and intends to turn left onto an arterial road. As he arrives at the intersection, there is a safe gap. He stops correctly then checks for traffic to the right. By the time he has checked, it is too late to take the gap so he waits for another safe gap then completes the turn. Assessment: The applicant is not required to take a safe gap that occurs before he has had a reasonable opportunity to observe traffic. Record a Yes for Gap Selection. Does not exceed the speed limit for a continuous period of 5 seconds or more. Does not exceed the speed limit for any duration in an area identified by a speed limit sign with the additional words ‘school’ or ‘school zone’ (when in operation). Does not exceed the speed limit by 5km/h or more at any time. When driving straight, drives at or close to the speed limit when conditions are suitable, but at a lower speed if conditions (e.g. wet or unsealed road, or in congested or slow traffic) make it unsafe to travel at the speed limit. When driving straight, does not drive 10km/h or more below the speed limit, unless conditions make it unsafe to travel closer to the speed limit. When merging, adjusts speed if necessary to choose a safe gap in the traffic. Note that speed advisory signs do not set limits. Applicants are not required to drive within the advised speed if conditions allow safe driving at a higher speed. If the applicant travels at 10km/h or more below the speed limit for a substantial part of the stage, a Critical Error (Too Slow) should be recorded unless conditions make it unsafe to travel closer to the limit. If a Critical Error (Too Slow) is recorded and Speed Choice is also being assessed for that task, No should be recorded for Speed Choice. Observed behaviour: During a straight drive downhill in a 60km/h zone, the speed of the vehicle momentarily creeps up to 62km/h. The applicant notices immediately and brakes, reducing the vehicle’s speed back to 60 km/h within 2 seconds. Assessment: The applicant did not exceed the speed limit for 5 seconds or more and did not exceed the speed limit by 5km/h at any time. Assuming this was the only breach, no penalty should be applied. Yes should be recorded for Speed Choice. Observed behaviour: On a straight drive in heavy rain and poor visibility, the applicant drives at 55km/h (similar to other drivers) on an arterial road with a limit of 70km/h. When driving straight in good conditions, maintains a following distance of at least 2 seconds. When driving straight in poor conditions (e.g. on a wet or unsealed road), maintains a following distance of at least 3 seconds. After changing lanes, resumes the applicable following distance (2 or 3 seconds, depending on conditions) behind the vehicle in front as soon as practicable. The applicant needs more time and distance to stop if a hazard is detected in poor conditions than in good conditions. When turning left or right from a road with marked lanes, commences the turn from a lane from which the relevant turn (left or right) is permitted. When turning into a multi-lane road, complies with road markings (if any) that require the turn to finish in a particular lane; and does not mislead other drivers by changing mid-turn to finish in a different lane. When travelling straight through an intersection, does not select a lane marked for turning. Does not drive in a bicycle-only lane (except for up to 50m when entering or leaving the road, pulling over to or out from the kerb or overtaking a right-turning vehicle). Does not travel in the left lane if it is intermittently blocked by parked vehicles and another lane is available. if turning right at an intersection other than a T-intersection or a roundabout, passes to the right of the centre of the intersection, unless road markings or a ‘Hook turn only’ sign impose a different requirement. Note that it may be difficult to judge where the centre of the intersection is located, so applicants should be penalised only for very clear breaches. if turning left from a road without marked lanes, commences the turn from as near as practicable to the left side of the road (see Figure 14). Positions the vehicle wholly within the lane (except when changing lanes) and does not wander from side to side within the lane. When driving along a road with only one lane or line of traffic for the applicant’s direction of travel, positions the vehicle as near as practical to the left. 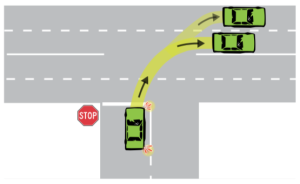 Note that it is not considered practical to drive close to the left roadside if this requires the applicant to diverge frequently around parked vehicles (see Figures 16, 17, 18). Maintains a lateral clearance of at least 1.2m from parked vehicles whenever possible (see Figure 16). Maintains a safe lateral clearance from vehicles travelling in other lanes. Does not contact any kerb when turning or negotiating a roundabout. Lateral Position is also assessed as a Stage Assessment Item in both test stages. Driving unnecessarily in the kerbside lane when there are parked vehicles should be avoided as it causes frequent lane changes that could create conflicts with others. Keeping 1.2m (door width) from parked vehicles allows for the chance a parked vehicle’s occupant opens the door without checking it is safe. In some cases (e.g. narrow streets with cars parked on both sides) the desired clearance may not be possible. 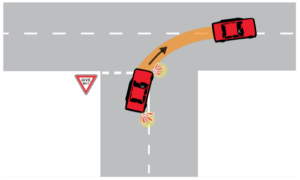 Figure 7: Correct lateral position on a right turn, keeping left of centre when entering and leaving the intersection. Figure 8: Incorrect lateral position on a right turn, failing to keep left of centre when entering/leaving the intersection. 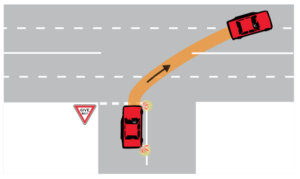 Figure 9: Incorrect right turn lateral position from a road with no marked lanes, not entering the intersection as near as practical to the centre line. Figure 10: Correct lateral position for a right turn into a multi-lane road. 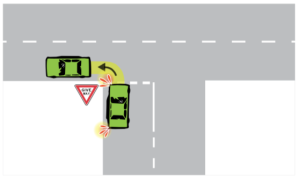 Figure 11: Incorrect lateral position for a right turn into a multi-lane road, failing to keep left of centre when leaving the intersection. Figure 12: Incorrect lateral position for a right turn, cutting across a double continuous centre line. 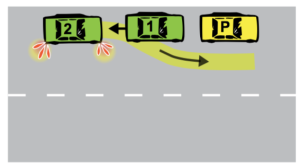 Figure 17: Incorrect lateral position when cars are parked at the left side of the road. (Note: ‘P’ indicates a parked vehicle.) 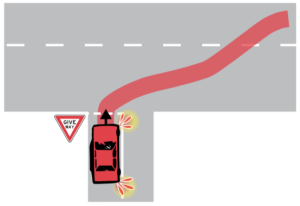 Figure 18: Incorrect lateral position on a road with only one lane or line of traffic for the applicant’s direction of travel, failing to keep as near as practical to the left side of the road. When reverse parking, looks out the rear window immediately before reversing. Completes the reverse park in no more than 4 movements and in no more than 2 minutes (unless traffic conditions make this unreasonable). Does not reverse more than 7m behind the rear of the vehicle in front (measured from the rear of the parked vehicle to the front of the applicant’s car) (Figure 19). Finishes with the front and rear left wheels within 300mm of the kerb. Finishes with the car front between 1 - 2m behind the rear of the vehicle in front. Does not hit the kerb heavily enough to cause discomfort to vehicle occupants. Does not allow any wheel to mount the kerb while parking. If one or more tyres contact the kerb but not heavily enough to cause discomfort to vehicle occupants and without mounting the kerb, no penalty is recorded. Makes a head check after activating the indicator immediately before pulling out. Pulls out from the kerb in either one or two movements. One reverse movement if required and one forward movement (see Figure 20). If the applicant allows 1 wheel of the vehicle to mount the kerb while leaving parking, but no other road user takes evasive action and there is no danger to property, a Critical Error (Mount Kerb) should be recorded. The head check must be done immediately before pulling out from the kerb to ensure there isn’t time for another vehicle to move into a dangerous position before pulling out. 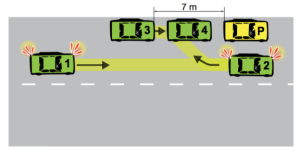 When performing a 3-point turn, the applicant is free to choose whether to pull over to the left before turning across the road to the right (Figure 21) and whether to turn between the kerbs or to make use of a driveway on the right roadside (Figure 22). If pulling over first, positions the car parallel to the kerb (within 300mm). Moves to the right kerb or into a driveway without hitting any kerb hard enough to cause discomfort to occupants and without allowing a wheel to mount a kerb. If using a driveway, does not enter private property (see Figure 23). Reverses away from the kerb or out of the driveway without hitting a kerb hard enough to cause discomfort and without allowing a wheel to mount a kerb. Returns to the correct side of the road when the manoeuvre is completed. Completes the manoeuvre in no more than 2 minutes and without moving across the road to the right more than once. The applicant is required to signal before pulling over to the kerb (if applicable) and before moving across the road to the right. Assessed under Signalling. If the applicant allows 1 wheel to mount the kerb while performing the 3-point turn, but no road user takes evasive action and there is no danger to property, a Critical Error (Mount Kerb) should be recorded (and a No for Turning Movement). 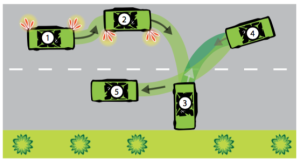 Figure 21: 3-point turn movements, including pulling over to the left (optional). 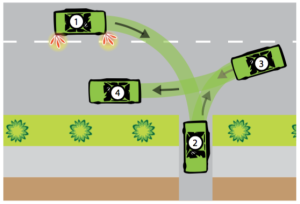 Figure 22: 3-point turn movements, including using a driveway (optional). Figure 23: Incorrect 3-point turn movement, travelling too far up the driveway and entering private property.